As per my email client, the frauds have become smarter. They have now devised ways to ‘forge messages’ which look like having been sent from genuine senders. A Sept.2008 post on Greater Voice. Click to enlarge. The modus operandi is such that they forge your e-mail address as the “From” field on the unsolicited e-mail. This doesn’t require the person to log in to the account. Sometimes, individuals forge message headers to suggest that the e-mail originated from your mail account. Then, the spammers also send unsolicited e-mails using bulk e-mail programs that forge headers in the e-mail message. Some of these programs combine the sender’s account name or e-mail address with another domain name to try and make it appear more authentic. The above methods clearly bypass your mail filters because the message appears to originate from the recipient’s own account. This is becoming very difficult practice to guard against. How secure is net, you can well guess. Many of my friends have also discussed with me some surprising mails that they keep getting, other than the now infamous ones … that you have won some lottery or jackpot worth millions … or promotion of viagra etc. 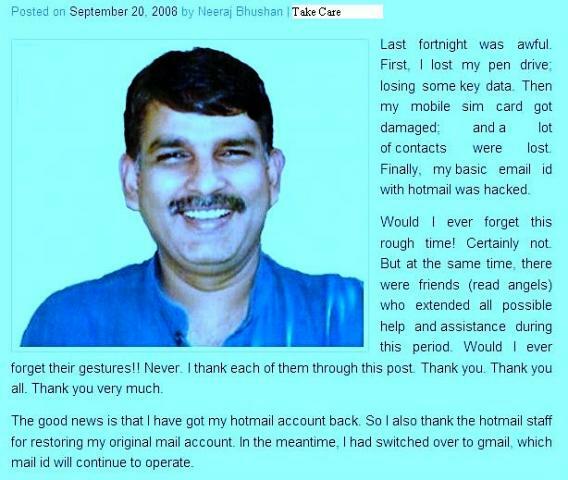 Such mails are undoubtedly from frauds, though with suggestive and tempting subject lines. Some examples are: “This is pretty interesting”, “This is amazing”, “You will certainly like this”. Sometimes, and quite shockingly, a user falls victim to some type of phishing scheme – when either they reply to an email that threatens to close their account if they don’t provide their password, or they go to a website that looks like their mail sign-in page and provide their password. A circular issued by India’s Department of Science and Technology also seems handy wherein the government has issued IT security guidelines. It can be accessed here in a pdf file. I also expect you to add if I have missed something that you might have experienced at your end.